Questions of design and ethics take on a new currency, form and prescience in a post-industrial, ‘post-truth’ landscape. The technological shifts that have re-organised work through the automation of labour are intimately connected to global social problems relating to immigration, racial and gender politics. New classifications of intelligence, ‘artificial’, ‘alternative’ and ‘false’, are produced and consumed through the design and management of infrastructures of information. Meanwhile, new experts in algorithmic cultures, engineering and synthetic biology pursue the application of these forms of intelligence in medicine, security, health and social care as practical solutions to complex social problems. Design and architecture occupy a powerful and precarious responsibility within this complexity, which goes beyond application and facilitation. Recent events in politics and design research highlight the deeply embedded social and political implications of work in design that can be so vulnerable to co-option and so valuable as a form of dissent. 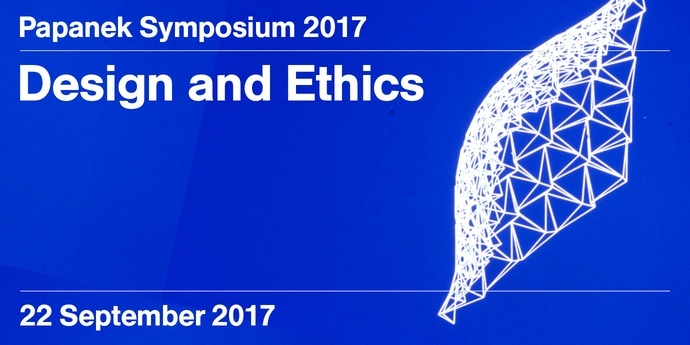 The Papanek Symposium 2017 will explore this unique position of design practice and research- contemporary, historical and anthropological-to address questions of ethics in design. Bringing academics and designers into dialogue, it aims to generate new ideas and critical thinking on the state of ethics in design and architecture today. David Breummer, Roboticist and Co-Founder of 5D Robotics, San Diego, California. Dr Bianca Eizenbaumer, Associate Professor in Design Research at Leeds College of Art and Co-Founder of Brave New Alps. Alexandra Daisy Ginsberg, Designer, Artist and Writer working with experimental synthetic biology, and its ethical implications, Royal College of Art, London. Dr Alison Powell, Assistant Professor and Programme Director of MSc Media and Communication, London School of Economics, London. Matthias Tarasiewicz, New Media Artist and Technology Theorist, Co-Founder of the Research Institute for Arts and Technology, Vienna. Professor Eyal Weizman, Architect, Professor of Spatial and Visual Cultures and Director of the Center for Research Architecture, Principal Investigator, Forensic Architecture, at Goldsmiths, University of London. This entry was posted in Uncategorized and tagged Alexandra Daisy Ginsberg, Alison J. Clarke, Alison Powell, Bianca Eizenbaumer, brave new alps, David Breummer, design, Designtheorie, ethics, Ethik, london, Matthias Tarasiewicz, papanek, Professor Eyal Weizman, research, symposium, theory. Bookmark the permalink.